HomeGold IRA BlogBarsWhat is Gold Bullion? Bullion is the term used to describe bulk precious metals, which are commonly-held commodities. Typically, bullion is in bar form although it does also come in coins. Gold bullion is strictly regulated; EU standards state that gold bars must be no less than 99.5 percent pure, while coins must meet a purity standard of at least 90 percent. Bullion value is ultimately defined by the mass and purity of the precious metal from which the bars or coins are crafted. There are a variety of uses for bullion – as a raw material and a tangible investment. How is Gold Bullion Graded? Gold bullion must meet specific purity requirements depending on where it’s being traded. When you purchase gold bullion for your investment portfolio, you need to be able to trust in what you’re buying. Modern labs use new XRF technology to analyze the gold bullion before it is sold to the investor. The process of weighing the bullion is also extremely regulated to ensure accuracy. Gold bullion is held to high quality standards. Over time, gold has proven that it retains and even expands its value. Investors choose gold as a hedge against the risk of currency collapse; for example, if the dollar crashes, gold bullion still retains value. 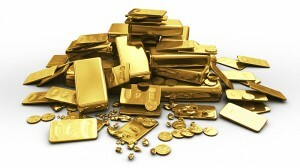 In addition, gold bullion makes a strong addition to a well-rounded portfolio. Gold can also be used to supplement retirement savings. For example, individuals who want to add to their pensions or existing retirement accounts can do so through a gold IRA. As previously mentioned, gold bullion is rigorously examined and assessed for purity. Even more strict than the EU is the London Bullion Market, which is an OTC market where wholesale silver and gold is traded. Gold bullion bars must be 99.5 percent pure in order to be suitable for trade. For silver, the purity requirements are even higher at 99.9 percent. Gold bullion comes in two forms — coins and bars. Coins trade near or at the world gold price, however, you’re looking at a premium of between 4 and 8 percent depending on how much you buy. Bars are simply more practical when it comes to buying gold bullion. For the purest gold bullion, the London Good Delivery Bar is the way to go. Gold bullion in bar form is available in different sizes, weighing anywhere from 1kg to 100 oz. You’ll see different sizes of gold bars on the New York and Zurich markets, but not in London. The London Good Delivery Bar is the “gold” standard when it comes to bullion. This bar weighs 400 troy ounces and measures approximately 11 inches in length.